The scene on Broadgate where the bomb was placed in the basket of a bicycle left in the city centre. In most British cities, the story of a terrorist attack in which the main perpetrator was never caught would be the subject of commemorations and calls for justice. Which is why it's so shocking to stumble across a description of an atrocity which killed five people and injured around 70 more - and hardly anybody remembers. But that's exactly what happened last year when I was browsing a local history website and came across a description of an IRA bombing on Coventry's main shopping street in the 1930s. Despite having worked in the city for two years, I had never heard of this attack - nor had my BBC colleagues. The site of the bombing had largely disappeared as a result of post-war redevelopment. There was nothing in the city to say what it had suffered. Realising we were fast approaching the 75th anniversary of the bombing, I set about trying to track down anybody who might have an insight into this terrible event, including families, historians and the injured. Drawing on resources such as genealogy websites, we were able to do our very own "Who Do You Think You Are?". A discussion with Irish historians established who had been behind the attack and our online article named him for the very first time. And eventually I tracked down all five families of the deceased, although some of the connections were more distant than others. What was clear was how much the loss of their family member still affected them - even 75 years on and despite the fact they had never met the victims. Marie Jones, the niece of Rex Gentle - a 30-year-old WH Smith worker who died in the blast - told me she often thought wistfully of the uncle he would have been to her. Similarly Jane Bant, whose uncle John Arnott was the youngest victim. He was remembered in the city as a cheeky, curly-haired teenager. Like many of the families, Mrs Bant - who lives in Coventry - could not understand why there was not a memorial anywhere in the city. When I approached the city council with this very question, there was initially some hesitancy. Were such things not best forgotten? 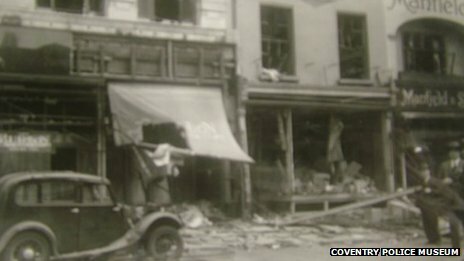 Coventry has a large Irish community, which suffered terribly in the aftermath of the blast - there were concerns a memorial would be insensitive. And yet, Coventry - because of the terrible damage it suffered during the Blitz - now styles itself as a city of "peace and reconciliation". What better way to express this than to remember the deceased as the families do - with sorrow, rather than bitterness? 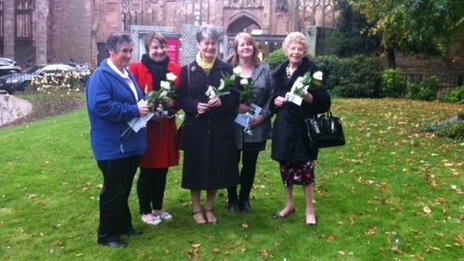 And so, last week, a memorial stone to the five people who lost their lives was finally unveiled, in the grounds of Coventry's cathedrals. 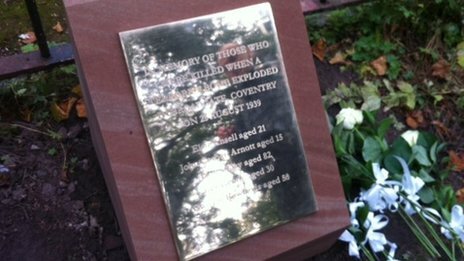 Hopefully its presence means the "forgotten" bombing of Coventry will never be overlooked again. Read the full story on the BBC Coventry and Warwickshire website, here.